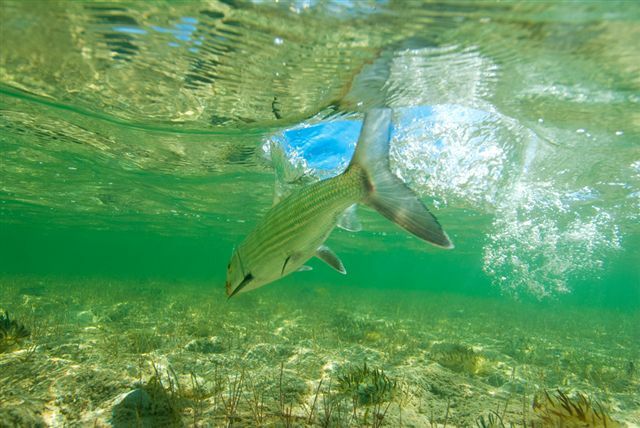 Bonefishing from Abaco Lodge gives you instant access to the famed Marls, a vast labyrinth of flats, mangroves… and bonefish, bonefish in numbers like nowhere else in the Bahamas. 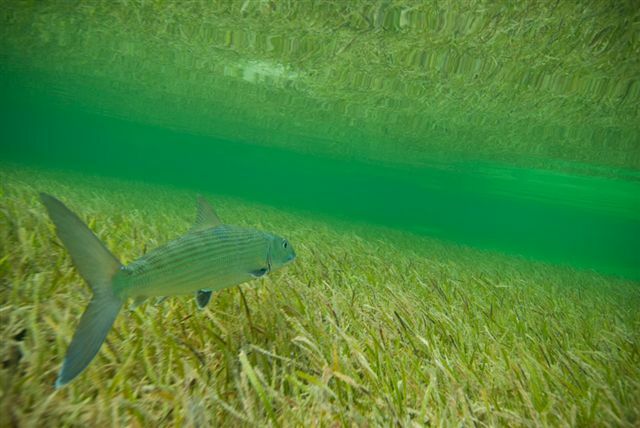 20-30 fish a day is not uncommon, with 200 square miles of this prime Bonefish habitat awaiting anglers. 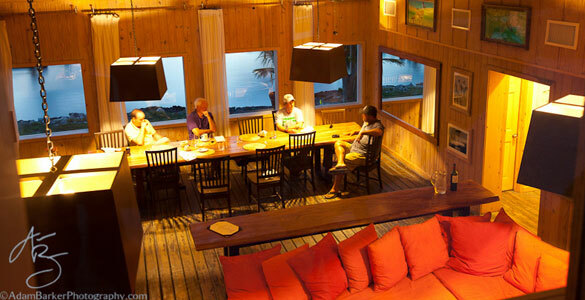 The islands most knowledgeable guides and Hell’s Bay flats boats ensure a productive fishing experience, while private rooms, fine dining and attentive service promise ultimate comfort. 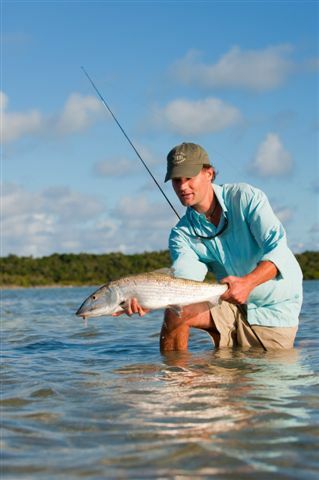 A number of direct flights from South Florida make Abaco lodge among the easiest bonefishing destinations. 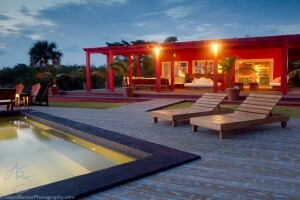 Abaco lodge has a nice European feel to its service and style. 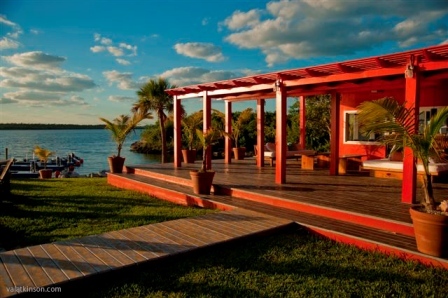 The owners are from Argentina and are well known for running top quality lodges in both the Bahamas and Argentina. 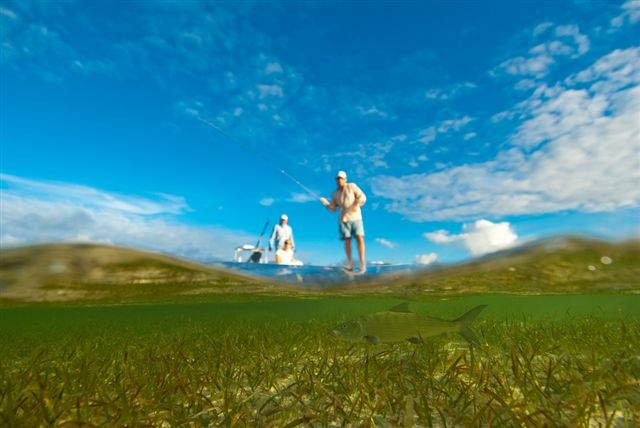 Come visit Abaco with Fly Fishing Heaven. 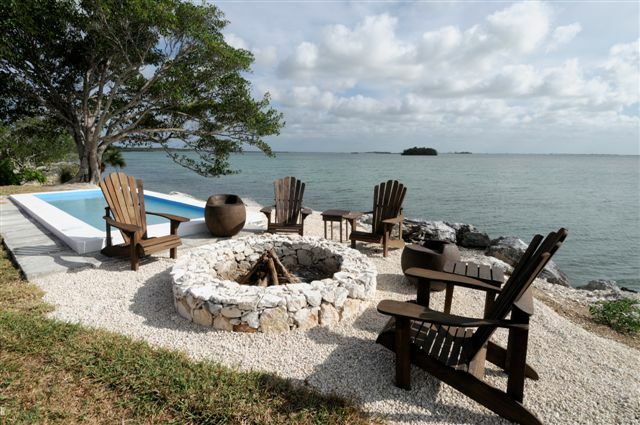 Abaco Lodge sits on the rocky shoreline of the Marls on the west side of Abaco, just north of Marsh Harbour on the way to Treasure Cay.The lodge consists of eight air conditioned private rooms with private bath, a fully stocked bar, pool, sitting room, an outside fire pit, and patio space. 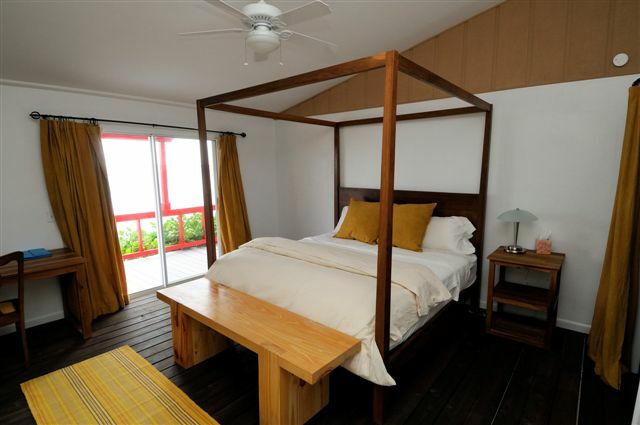 You can fish all day and not miss a beat of what is going on at home; a computer with high speed internet is available for the clients as well as a wireless connection, phone service is available and the lodge has a new flat screen television for all the games. Bar and fly-tying room: The lodge has a main bar fully stocked with spirits, cold beers, (in a convenient mini fridge) soft drinks, plenty of ice, a blender and mixers for cocktails. 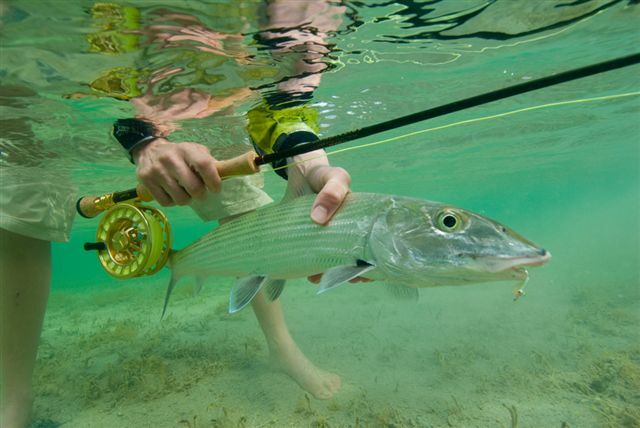 Our shop is stocked with the following: Sage rods – Abel reels – Rio lines, backing and tippets – a good selection of flies – sunscreen and lip protectors – Mangrove sungloves – dry bags – Action optics polarized sunglasses – Bair’s Lodge Fishing shirts, caps and t-shirts. 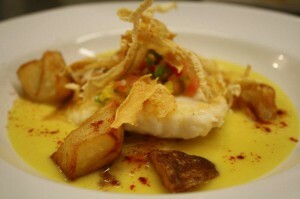 We pride ourselves with serving delicious food of fresh local produce, specializing on fresh fish (mahi, tuna, grouper, and snapper) conch and lobster.We carefully stock our pantries and coolers with fine quality foods from the US and Nassau. Our chef bakes bread, pastries and cookies daily. Our coffee is made from freshly ground beans and will be waiting for our guests in the buffet or we will bring a cup of coffee to your room! A full breakfast will always feature a variety of cereals, coffee and a selection of teas, as well as fresh fruits. Eggs will be cooked to your preference, with bacon, sausages and grits or hash brown potatoes. Hot cereals are also available. A lunch menu card allows you to choose next day’s lunch and the content of the boat coolers. We have an open bar policy at the lodge. On your return from fishing you will find cold beers, spirits, and a blender for cocktails, as well as stacks of soft drinks. 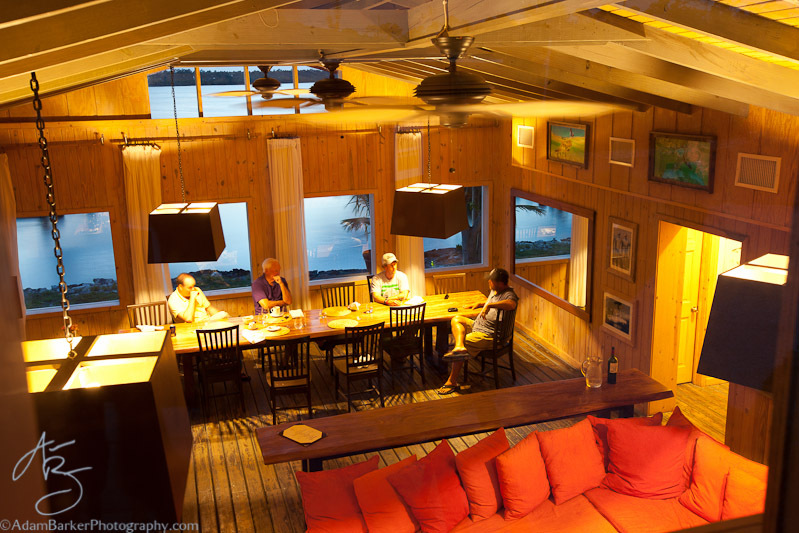 Delicious appetizers are served in the verandah, so you can sample local specialties such as cracked conch, grouper Fingers and conch salad. If you have a preferred brand of liquor, please be sure to let us know in advance so the lodge can have it ready for you upon arrival (payable upon arrival to the lodge). Otherwise, you can bring your own bottle. Please note that local spirits will be available free of charge at the lodge. Our emphasis is on mixing local dishes with light fresh recipes such as snapper with mango salsa, and some barbequed beef, fish and chicken. Desserts will vary from chocolate decadence to key lime parfaits and rum cake with coconut ice cream. 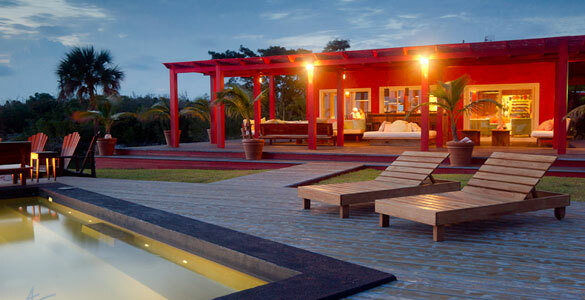 House wines such as Chilean Chardonnay, Sauvignon Blanc, Merlot and Cabernet Sauvignon will be served with dinner. After dinner coffee and tea and liquors will be served in the sitting room. We can cater to special dietary needs.The lodge has a good supply of drinking water from our reverse Osmosis system. You will find water in your bedroom and your boat, and you can drink the tap water. In our arid climate, conservation is always appreciated. 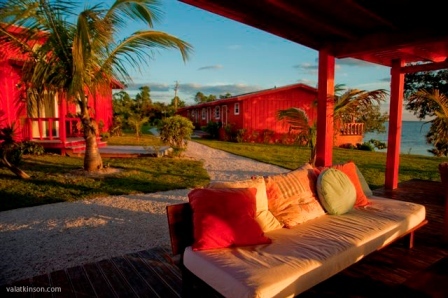 Abaco has more than 400 square miles of flats, none better known than the Marls on the western side of the island. Abaco lodge is centrally located directly on the Marl side of the island with access to them all. 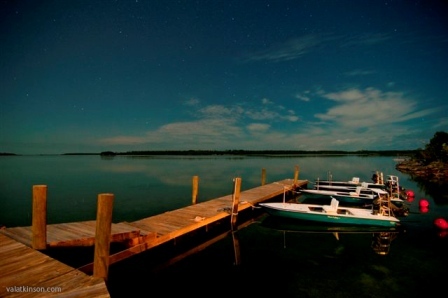 For twenty miles the average depth is four feet, a bonefisherman couldn’t ask for a better backyard. 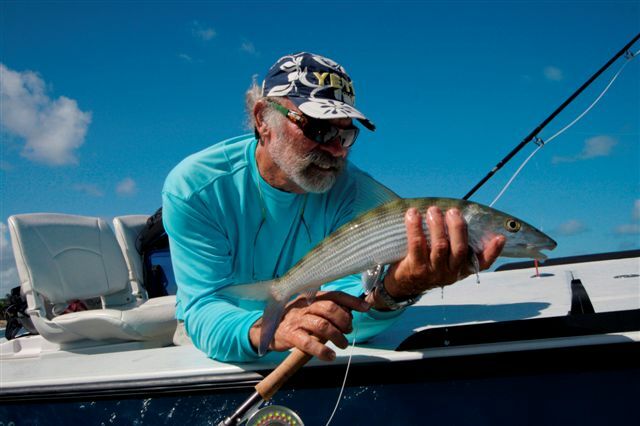 It would take a lifetime to fish the entire Marls alone but Abaco also offers some incredible fishing on the eastern ocean side of the island as well. Cherokee Sound, the Bight of Robinson and Snake Cay are minutes from the lodge and offer opportunities at incredible but challenging bonefish. With the numerous options available it is very rare to miss a day of fishing due to weather. 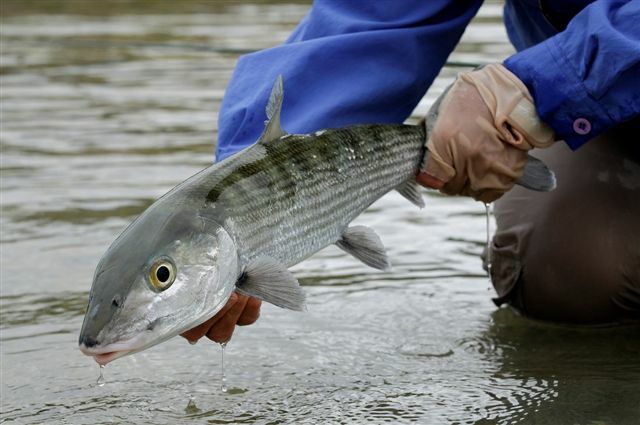 The typical trip does not fish on arrival or departure but we can arrange for a half day fishing if your flights allow. Breakfast is severed at seven; we leave the dock at eight and return between four and five. This schedule can be tailored to your needs with advance notice. Picnic lunches and cold drinks are taken to the flats in a cooler by your guide. 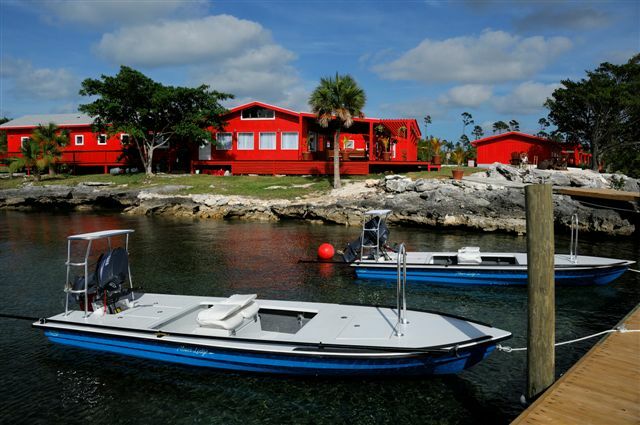 We access the Marls directly from the lodge dock, the flats on the ocean side require a short drive. 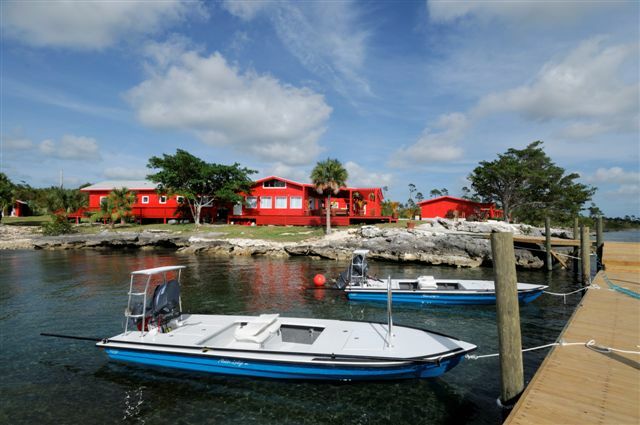 Abaco Lodge is outfitted with a brand new fleet of Hells Bay Waterman skiffs, the world’s finest light tackle fishing skiffs. All of them are equipped with padded seats with a backrest and a lean bar in the front and are powered with Yamaha 50HP engines. 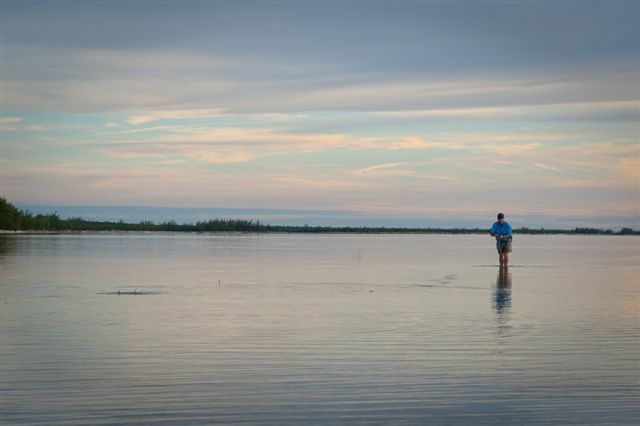 The majority of the fishing is done from the boat but wading opportunities exist if you prefer. Runs to the flats vary from 10 to 45 minutes. 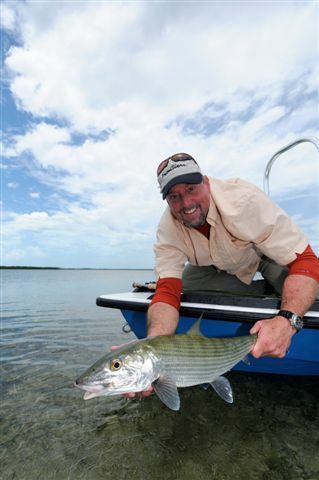 The bonefish on the Marls average 2-4 pounds with the occasional shot at bigger fish. 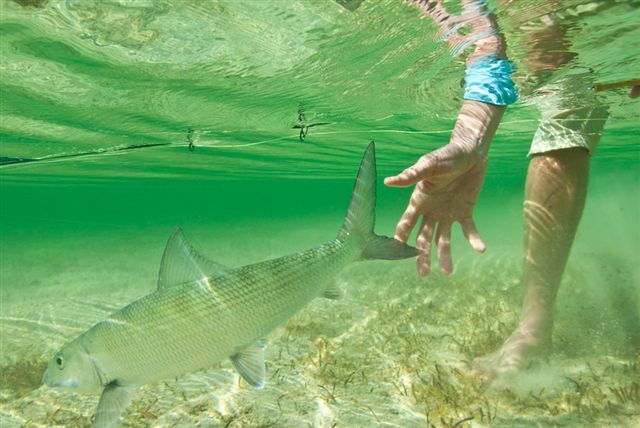 The ocean side flats offer opportunities as some of the largest bonefish in the Bahamas, but they are incredible wary creatures. 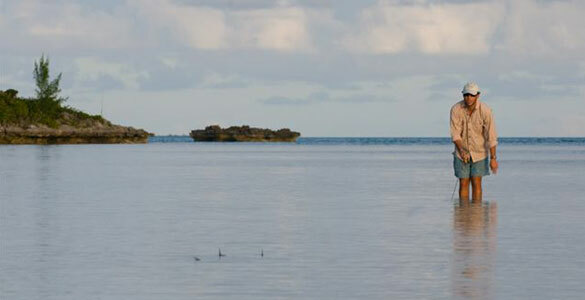 The Bahamas are primarily a bonefishery and Abaco is no different. 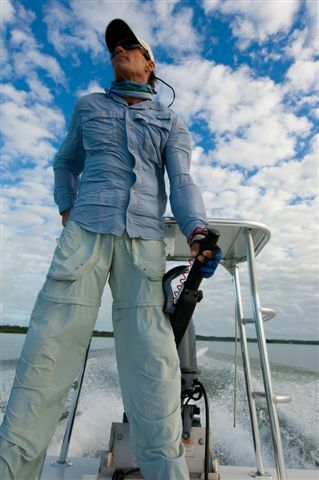 There are the occasional shots at permit, tarpon, ‘cudas, jacks, and sharks and we recommend you bring the appropriate tackle just in case. 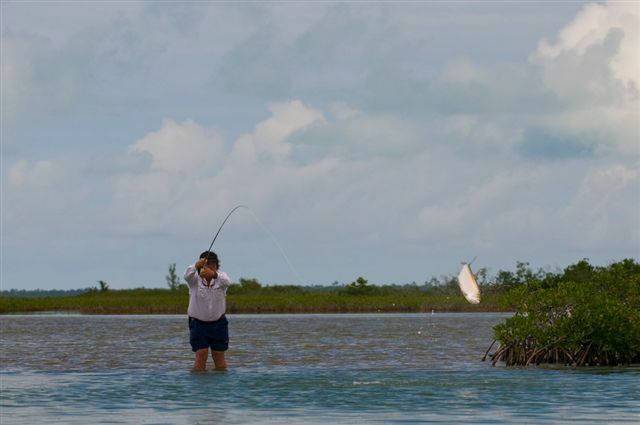 There is nothing like seeing a 20 lb permit tailing or the juvenile tarpon cruising the flat and not having the right gear set up. 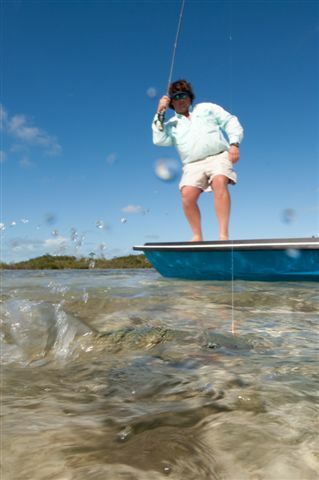 In addition to the wonderful flats fishing Abaco has incredible blue water fishing. We are happy to coordinate a day or two with the best captains available in search of marlin, sailfish, Dorado, wahoo, or tuna depending on the season. 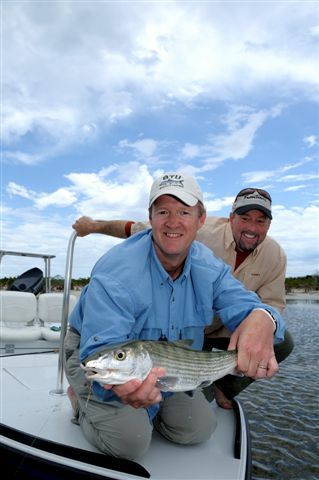 Arrangements can be made at the lodge but the best captains book early and we recommend you do as well. 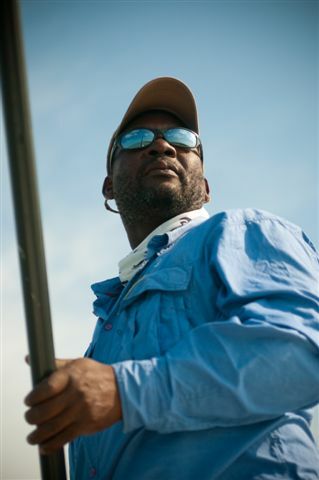 There will be an additional charge for this fishing. 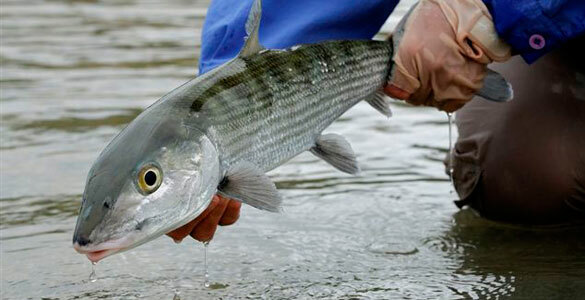 Bonefish are amphidromous, living in inshore tropical waters, moving onto shallow tidal flats to feed with the incoming tide, and retreating to deeper water as the tide ebbs. Its weight may reach 5lbs, though a more representative size would be about a third of that. 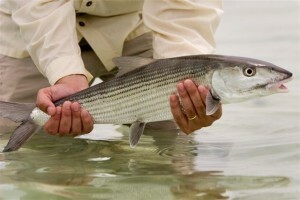 A big bonefish, a lifetime fish would be any fish in excess of ten pounds or more. Silvery in color with dusky fins—the bases of the pectoral fins are yellow. Heavily schooling fish, with some of the larger individuals traveling singly or in schools. 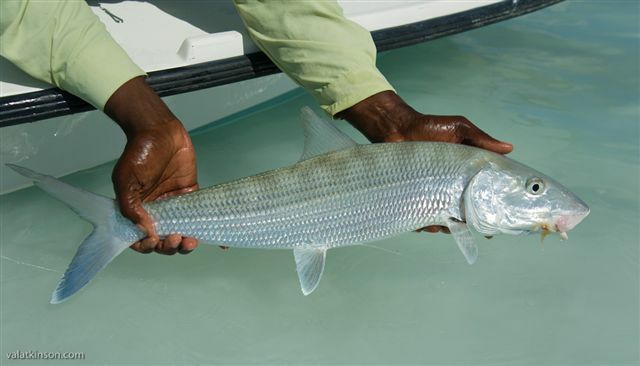 Bonefish are considered to be among the world’s premier game fish, but they are virtually inedible, and they are eaten only in some locations by native populations. 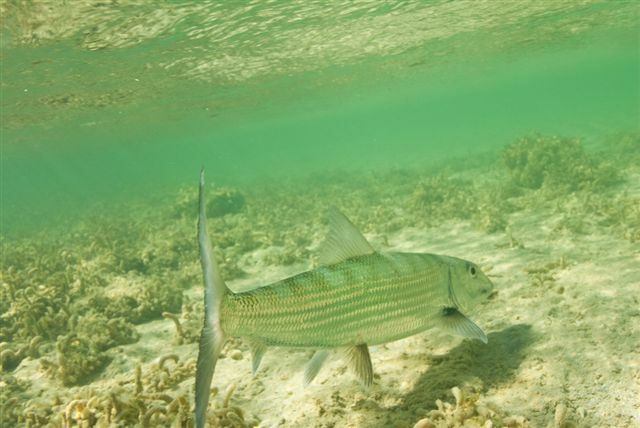 As prolific as bonefish are, relatively little is known about them. 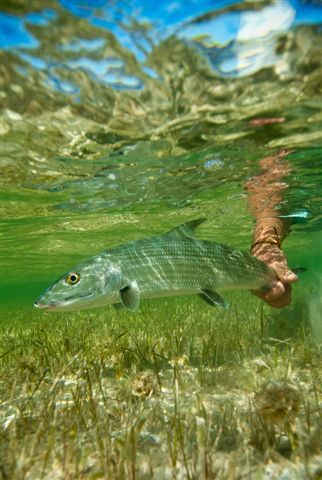 The Bonefish Tarpon Trust is doing a great deal of scientific research on bonefish currently, and if you desire further information, they are an excellent and angler friendly source. Visit www.tarbone.org. 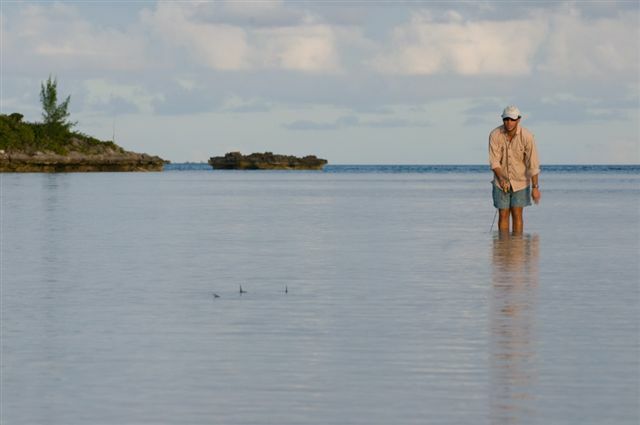 Bonefishing is a shallow-water pursuit done in depths ranging from 8 inches to several feet. 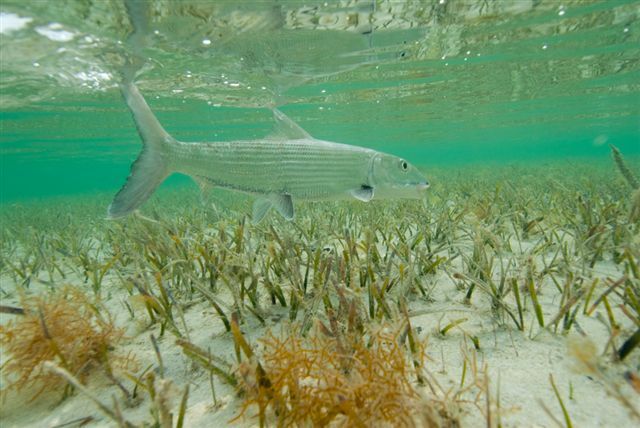 Flats sporting currents; dropoffs along the edge and clean, healthy seagrass beds produce abundant small crabs and shrimps that bonefish prey upon. 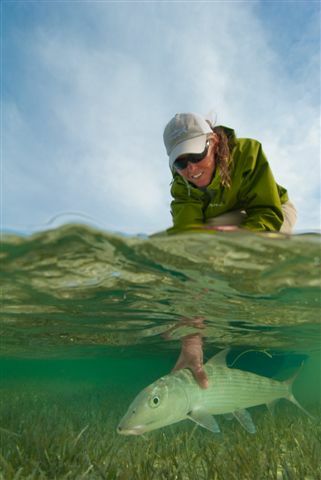 Bonefish are known to follow stingrays, looking for small prey items disturbed by the rooting stingrays. 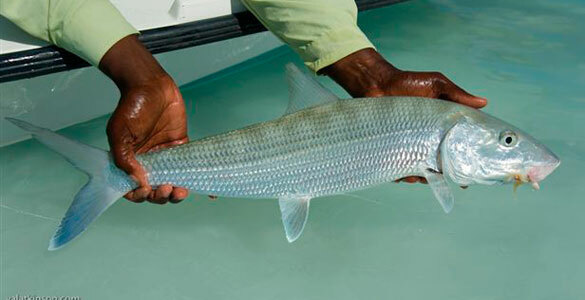 The Bonefish prefers shallows, estuaries, bays, grass flats, and other brackish areas at a depth from 0 to 84 meters. It is found worldwide in subtropical warm seas. In the Eastern Pacific, its range includes waters off California to Peru; the Western Atlantic range stretches from North Carolina to Florida, the Bahamas, the Antilles and the rest of the Caribbean almost to Brazil. 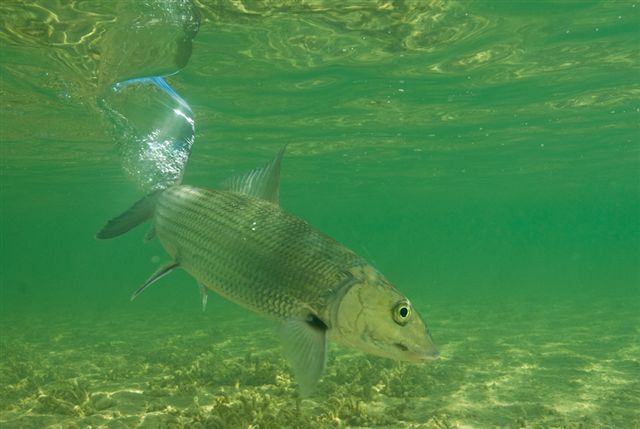 A pelagic fish, the Bonefish feeds on benthic creatures such as worms, crustaceans, and mollusks, rooting them out from the sandy bottom. 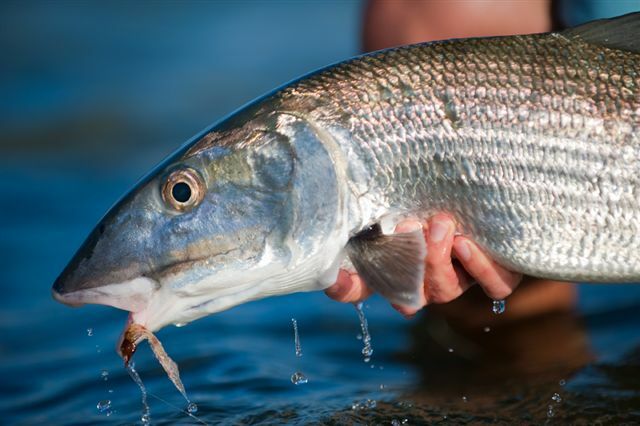 Granular teeth, forming specialized dental plates, cover the bonefish’s tongue and upper jaw, and similar grinders are also present in the throat, helping the fish to grind up its prey. Small to medium-size bones often feed in schools. Sharks and barracuda frequently prey on bonefish, which may explain why the fish evolved such a sleek body for a fast getaway over the ages. 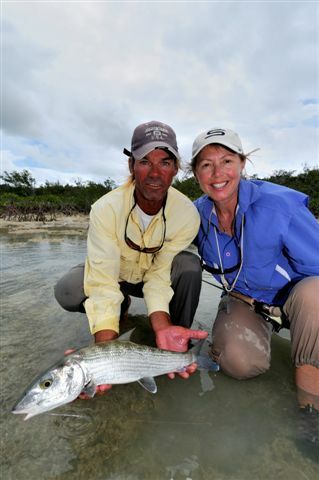 Please take a look at the photo and video galleries related to bonefishing on Abaco and Abaco Lodge. 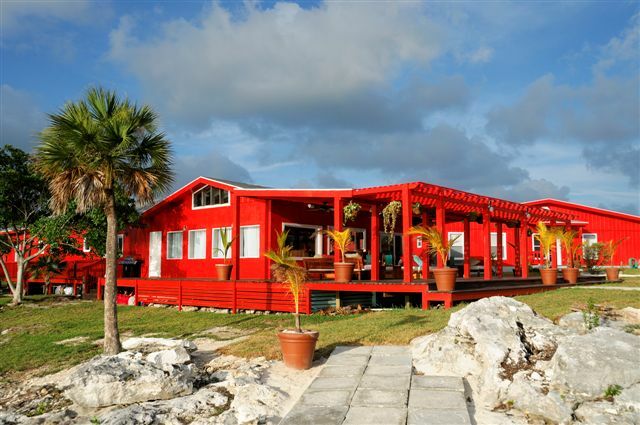 Although Abaco Lodge is a beautiful spot with the best service, food etc of any lodge on earth, there is still not much to do but fish, so it may not be the best destinations for the non fishing spouse, or family member! Drop me an email so we can make sure that this destination will meet your non fishing needs. 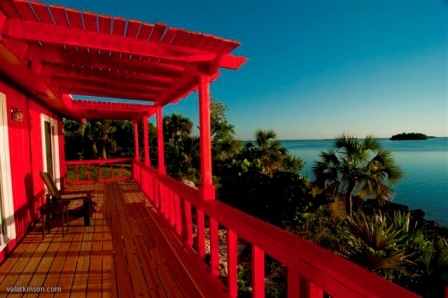 Unlike the majority of other islands in the Bahamas it is possible to fly directly to Marsh Harbour from the U.S. mainland. While it is also possible to fly via Nassau, a direct flight from Florida is by far the easiest. 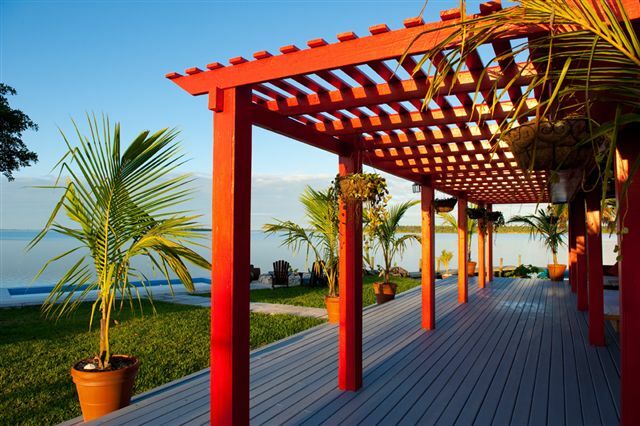 On arrival at Marsh Harbour you will be met by a lodge representative, who will transfer you to the lodge. 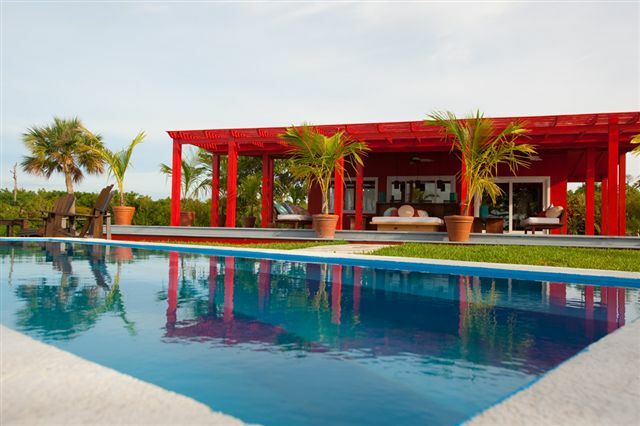 It is a short 10 minute drive and the cost is included in the package. If you are delayed or miss your flight please contact the lodge at 242-458-4659. 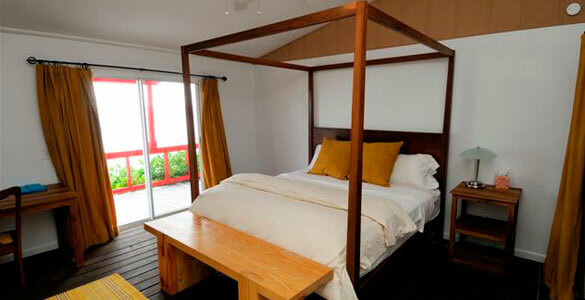 When you arrive at the lodge, our welcoming staff will greet you and show you to your room. 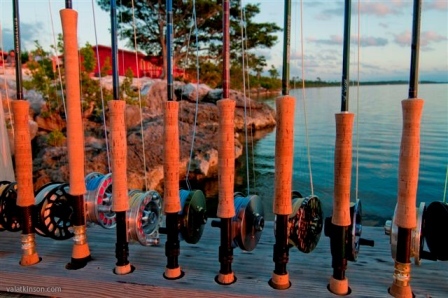 There is no organized fishing scheduled for your arrival day, but this can be arranged prior to arrival. If not you may spend the day either wade fishing in front of the lodge, or relaxing in the pool with a refreshing drink. 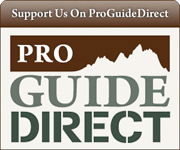 Our staff would be happy to help you assemble your gear if you do choose to fish. On your departure day, you will be taken back to Marsh Harbour with plenty of time to catch your flight. Abaco Lodge Manager will assist you with timing your departure from the lodge the night before. You will need a valid passport. No Visa is required for US or UK passengers, but other nationalities should check with their local consulate. 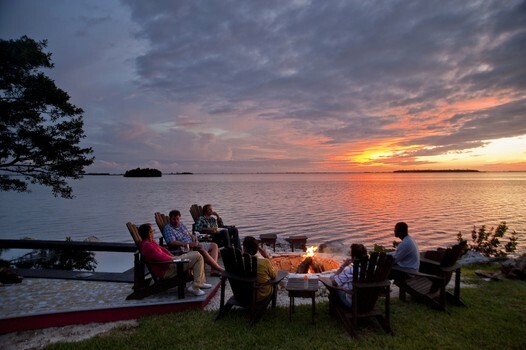 You do not need any inoculations to travel to the Bahamas. If you have a health condition, please make sure to bring ALL the medication you will require for your stay. Please notify the lodge of any health conditions or concerns we should be aware of. You can do this with the Pre Trip Questionnaire, which you can submit online at www.nervouswaters.com/PreTrip.aspx The lodge has a basic first aid supply but please bring any item you think you might need.